Automatic Isolation Tester is developed to measure the Isolation Resistance between Pin to Pin and Pin to Chassis of UUT automatically. It will reduce the man hours and generate the reports with Pass/Fail criteria. 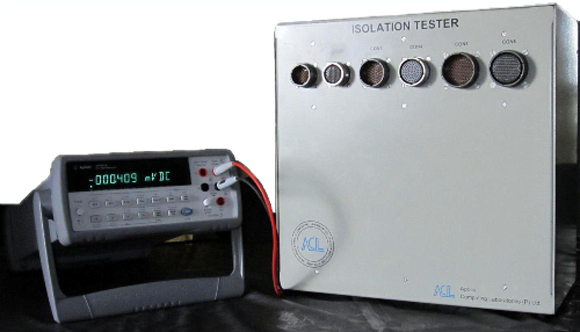 Isolation tester is built in rugged mechanical enclosure of size 350mm X 350mm X 200mm. Isolation Test setup requires one PC/IPC having two RS-232 ports, one 6 1/2 Multi metre and Isolation tester. Isolation tester is interfaced with PC through one RS-232 serial line, and multi metre is connected to PC through another RS-232 serial line. Isolation tester receives the instructions from the PC for Mechanical Relay switching operation. Tester reads 120 readings per minute and stored in PC. User friendly GUI Interactive software for connector selection. Supported by HOST of drivers for Windows / Linux. Tester is ideal to check isolation or Resistance of Airborne, Ship borne, Military & other Strategic equipments.